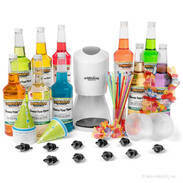 Are you looking for a fun and different activity for your next party or family gathering? Fresh and fluffy shaved ice could be the perfect solution! 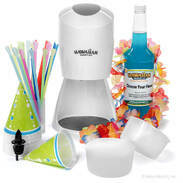 With our variety of shaved ice machine packages, you will have all the ingredients for guaranteed entertainment. 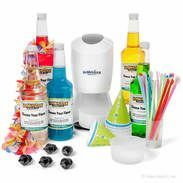 Each of our packages comes with an easy to use shaved ice machine, delicious, flavored shaved ice syrups, bottle pourers for each syrup, cups, and spoon straws. Children and adults will enjoy the experience of making, serving, and of course, consuming cool, crisp Hawaiian shaved ice wherever and whenever. 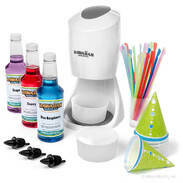 Some packages allow you to choose your own syrup flavors, while others come with a set of pre-selected syrups. 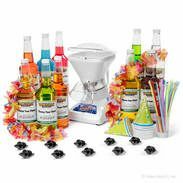 When you get your very own complete Hawaiian shaved ice package, you'll look like a true shaved ice professional, easily whipping some up in minutes, all while impressing those watching. The best part? You won't even have to wait until summer or for the county fair to roll around just to get your shaved ice fix.